Hanan grew up in the foster care system. At 18, she gave birth to a daughter and quickly learned the difficulties associated with parenting and providing for herself and her child. The idea of finding a job, much less a career that would provide for her and her daughter, seemed unobtainable. She dreamed of providing a stable life for her daughter. From left: Hanan, a single mother who aged out of the foster care system, found an internship with Social Spin owner Christy Moore, thanks to Jewish Family and Children’s Service’s Transition to Adulthood and Real World Job Development program and its youth development coordinator, Julie Jupp (photo courtesy of JFCS). Upon reaching her 18th birthday, Hanan was like thousands of other young men and women, released from the foster care system with zero support and no place to live. Hanan was encouraged to seek help from Jewish Family and Children’s Service (JFCS). The Transition to Adulthood and Real World Job Development (RWJD) programs offer support and direction for youth that age out of the foster system. Participants in the RWJD program receive academic, career and living skills assessments. And thanks to valuable partnerships with local businesses willing to offer job training and internships paid for by JFCS, participants go on to find work in schools, hospitals, veterinary clinics, small businesses, and more. 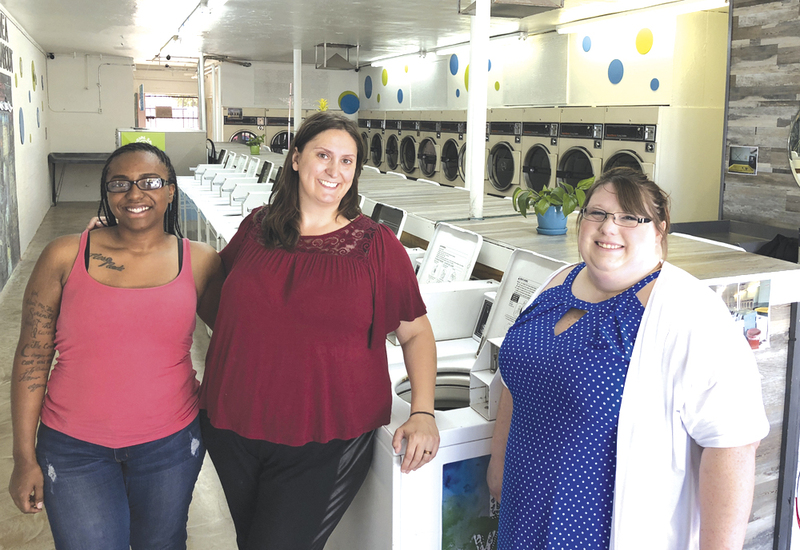 For Hanan, now 20, her internship at Social Spin, an innovative laundromat and dry-cleaning business, helped spark a passion for civic engagement and social capital. Through her involvement with RWJD, Hanan has been attending Gateway Community College while pursuing an associate’s degree in psychology and gaining employment skills via her internship, various workshops and one-on-one case management. JFCS credits its volunteers, donors and valuable business partners for the success of its Transition to Adulthood and Real World Job Development programs. Not only do they help individual participants, but the good trickles down to the community. Social Spin Founder Christy Moore, MSW, has made it a priority to partner with programs like Real World Job Development to employ interns who need to develop important work skills so they can enter the job market full time in the future. If you represent a business and want to hear more about how you and your organization can provide onsite job training or apprenticeships paid for by JFCS, call 602-279-0084. Individuals interested in volunteering in the Transition to Adulthood Program, which helps foster care teens with career planning, daily living skills, enrolling in college, finance management and more, can e-mail VolunteerCoordinator@jfcsaz.org. Editor’s note: Julie Jupp is the Real World Job Development (RWJD) youth development coordinator for Jewish Family & Children’s Service.